The monochromatic tones of the cold months have given way to new growth greens and even tiny dots of color if you know where to look. The snows keep falling every few days in the mountains, but you can tell their efforts have less impact under the mighty sun. We have wintry days and we have springlike days, but the trend is toward leaving the warm hats and gloves behind because the sunshine feels so good on your back – like an old friend offering a backrub after the long slog of a low-powder winter. 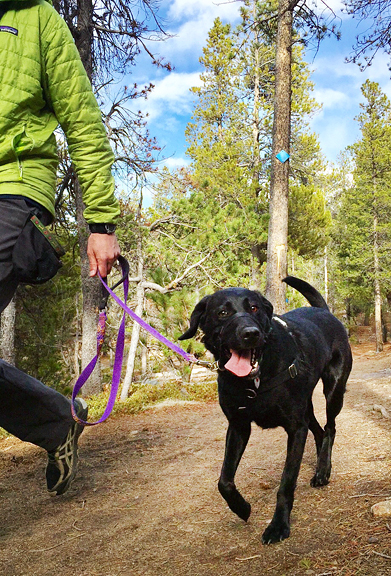 The trails are more dirt than snow around town (still snowy in the high country) and all three of us have been anxious to get out for hikes and trail runs. Reacquainting ourselves with those warm weather muscles that get neglected during ski season. Our spring cleaning efforts have been ongoing such that it feels like this could become a habit. Taking a proactive approach to the chest freezer, I am excavating all of those random food items that might otherwise languish in the depths for years and incorporating them into our menus. Two little pork tenderloin chops became a lovely meal of tonkatsu rounded out with leftover vegetables, rice with furikake, and Japanese potato salad. I must confess that I was more excited about the potato salad than the tonkatsu. Before a few weeks ago, the only time I ate Japanese potato salad was at Japanese or Korean restaurants. I’m slightly addicted to the creamy, tangy, slightly sweet, salad and once Marc posted the recipe, I knew it was my destiny. It’s dangerously easy to make. Having made this salad a couple of times now, it’s fair to say there is great flexibility to tweak it to your liking. I now omit the carrots and onions because I’m “meh” on the carrots and Jeremy isn’t a fan of the onions. I also tend to add more cucumbers and rice vinegar. The point is that you can adjust it to suit your tastes. I do recommend using Persian or English cucumbers instead of slicing cucumbers, because they are more crisp and don’t have pulpy seedy centers. 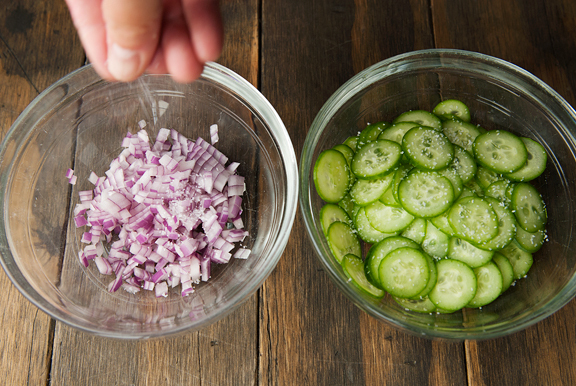 The purpose of salting the onions and cucumbers is to draw out some of the liquid. I salt them while the potatoes and carrots are boiling and let them sit for a good 20 minutes or so. Squeeze as much liquid from the cucumbers as possible. Rinse the onions in cold water, then give them a good squeeze, too. 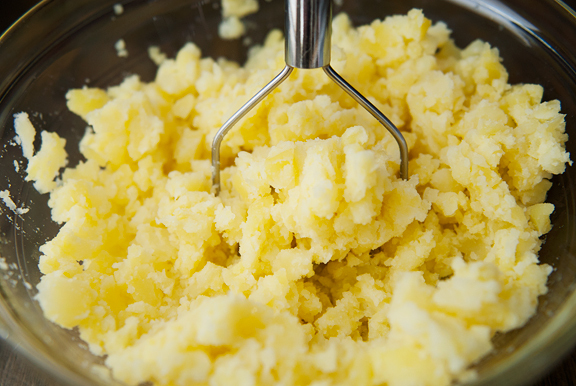 Mash the potatoes as much or as little as you like. I’ve had chunky Japanese potato salad and I’ve had silky smooth Japanese potato salad. They’re both great. I like to mash my potatoes so that they strike a nice balance between both textures. The cucumbers are probably my favorite part of the whole salad because of their crunchiness. The first time I made the salad, I ate several spoonfuls straight out of the mixing bowl as Neva sat politely in the hopes that some ham might fall her way. I imagine this will get heavy rotation as summer approaches because it’s a versatile side dish (I’m thinking barbecue, grilled things, sushi, etc.) 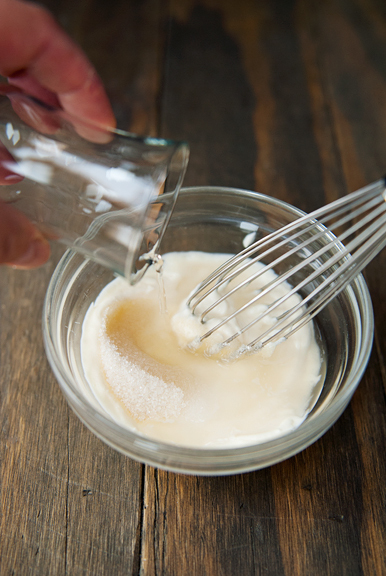 that keeps easily in the refrigerator and can be made in large batches. 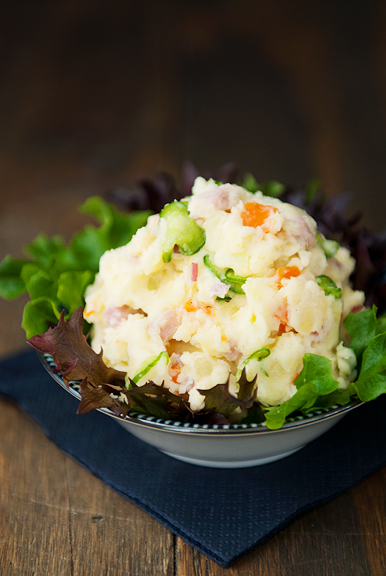 If you’re looking for something a little different from your typical potato salad, this one delivers. 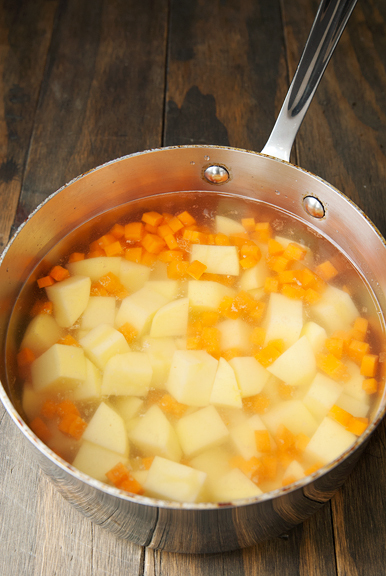 Prepare the vegetables: Place the potatoes and carrots in a medium or large pot and cover with cold water. Set over medium-high heat and bring the water to a boil. Reduce heat to avoid boiling over. Cook for 20-25 minutes until the potatoes are tender when pierced with a fork. 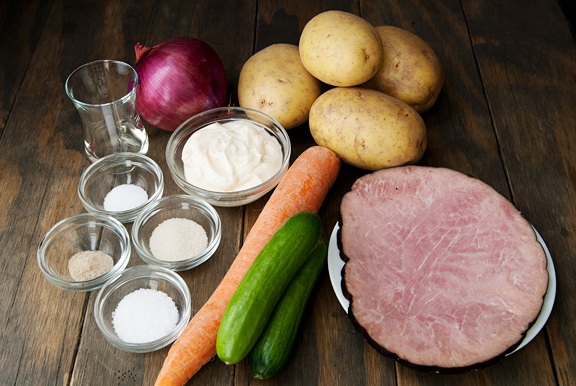 While the potatoes and carrots cook, place the cucumbers in a bowl and sprinkle a generous pinch of salt over them. Mix together and let sit. Place the onions in a bowl and sprinkle with a generous pinch of salt. Mix the onions and salt and let sit. 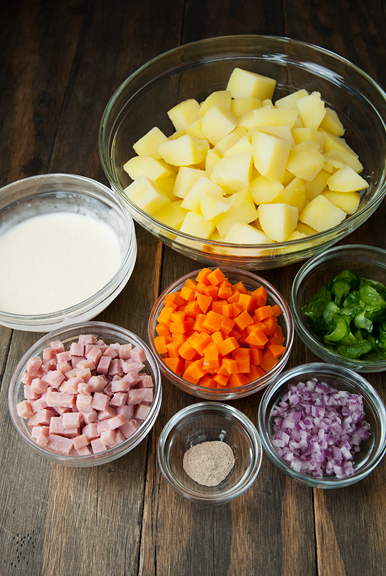 Make the dressing: Mix all of the dressing ingredients together until smooth. 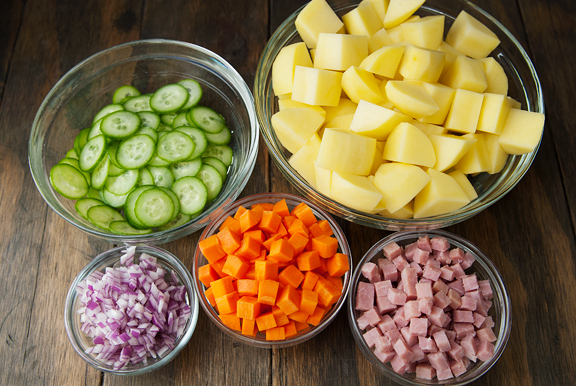 Assemble the potato salad: Drain the potatoes and carrots. Mash the potatoes roughly (you can mash the carrots with the potatoes or separate the carrots and mash the potatoes only, adding the carrots after the mashing). 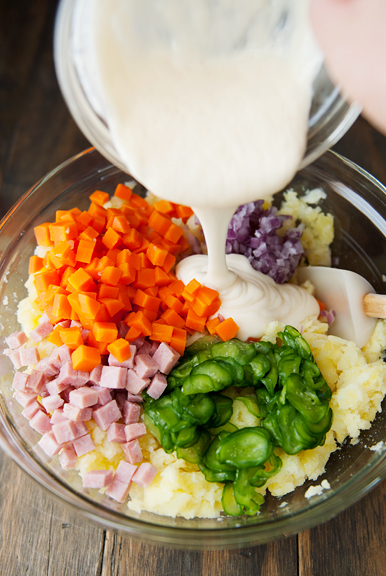 Mix the dressing into the potatoes and carrots. Squeeze the liquid out of the cucumbers with your hands (discard the liquid). Rinse the onions in cold water, strain, and squeeze any liquid from the onions. Stir the cucumbers, onions, and ham into the salad. Season with salt and white pepper to taste. Serves 8 as a side dish. Have to try this. I’m not used to a sweet potato salad, but more, one that is briny. Still, the bits of other veggies like the cucumbers are really appealing. Plus, it’s gorgeous! 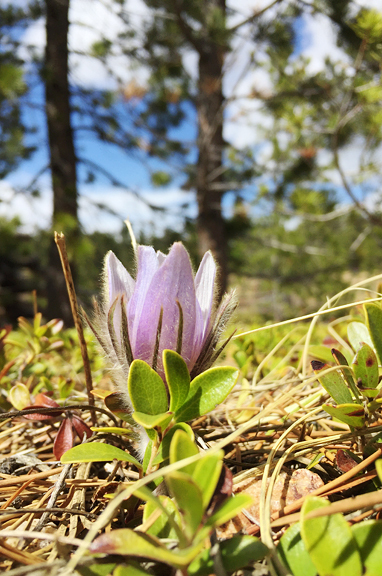 Happy spring to you, and to long trail runs. Super excited for this recipe! 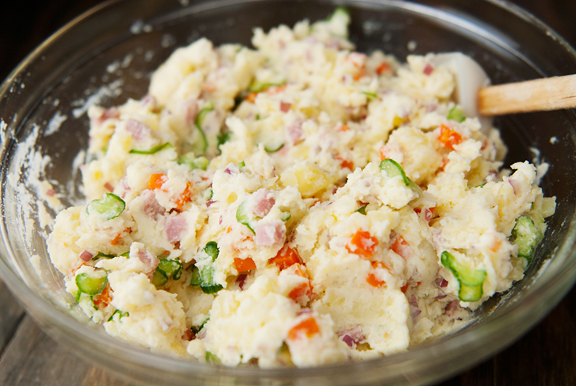 I’ve never settled on “the one” potato salad and I’m eager to make this for upcoming grilling season. We got a nice charcoal grill and I’ll be making pork char siu soon! As much as I love it over rice I think a side of asparagus and this salad would work great. Hello! I’m one of your long time (11 years) lurkers. I couldn’t resist commenting on this salad because more than anything else it reminds me of genuine Russian/Olivier Salad. 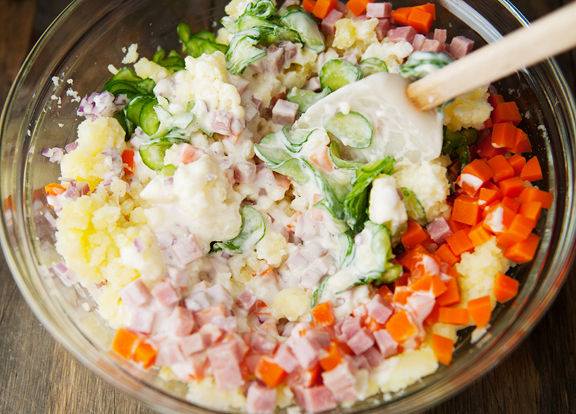 Boiled potatoes and carrots, cucumbers/pickles, prawn/ham, boiled egg and petits pois all finely cubed and mixed with a mayonnaise based dressing. We also make a summer soup called “okroshka” (literally crumbled) which has boiled potato, cucumber, radishes, ham, boiled egg, spring onion and dill which are topped up with kefir or kvas to make a soup. 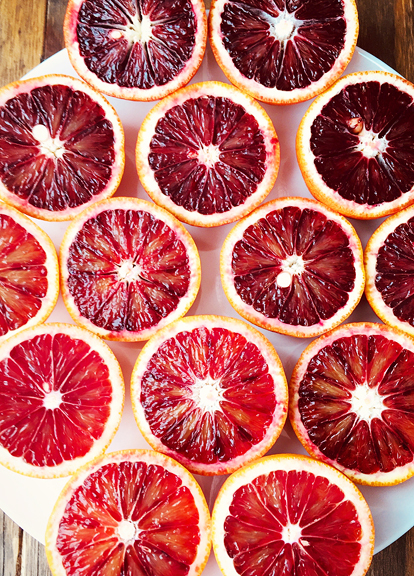 This makes for a wonderfully refreshing yet filling summer dinner. Good luck with the hiking! Best wishes from Scotland! 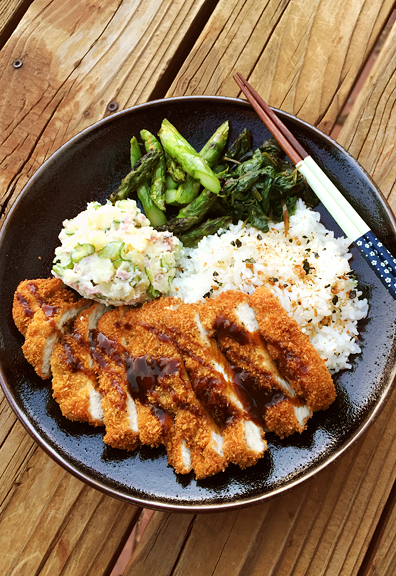 Love this salad and love the tonkatsu combo! Thanks for sharing! Ken – You’re so welcome!